Exclusively for members with FSN websites. Just days after a flower arrangement from your FSN website is delivered, the recipient will receive an automated Feedback Request via email. These are designed to: encourage the recipient to leave a review about their arrangement, give general flower care tips, ask if they need to send an arrangement. 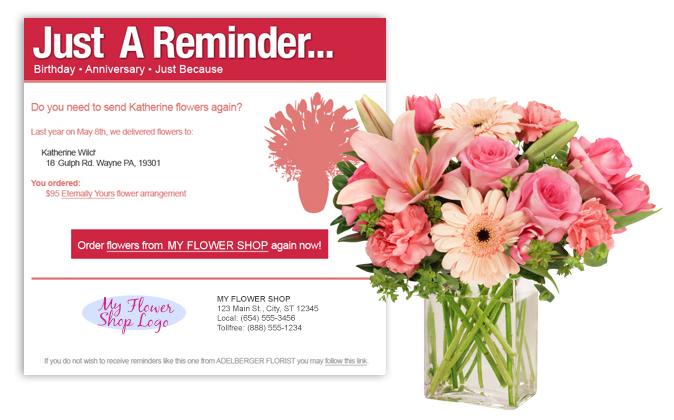 Feedback requests and reminders are branded to represent your flower shop with its specific style, colors and information. All feedback requests include flower arrangements from your website. Customers can order with just one click - from their computer or smartphones! Recipient Feedback Requests also include general flower care tips to help customer's flower arrangement stay fresher, longer. Your website customers will receive emails annually for special occasions when they've previously sent flowers, such as a birthday or anniversary. Smart reminders are sent annually to customers who have previously sent flowers through your FSN website to encourage repeat business for special occasions, such as a birthday or anniversary. All emails are branded to use your shop's information and link directly to your website.